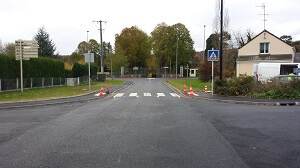 Objective : Boost the visibility of pedestrians crossing at the entrance to the town. Install pedestrian crossing markings to increase visibility and warn that a pedestrian is about to cross the road. In principle, this type of pedestrian crossing is well protected by the traffic lights (vehicles stop on the red light and pedestrians cross). 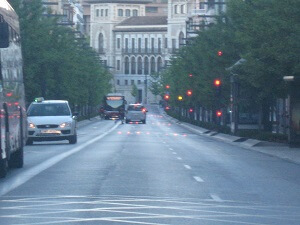 However, it is good to mark the pedestrian crossing when it traverses a road with two or more lanes in each direction. Solution: a line of red MEGALUX studs across the entire road activated in time with the traffic lights to clearly identify the red traffic light phase. Many isolated pedestrian crossings need boosted signage, either because they are located near a school or hospital or because they provide access to a major tourist or shopping zone and high traffic or pedestrian volumes have been recorded. MEGALUX studs are effective during the day, automatically adjusting their light intensity according to ambient light levels. This is a simple solution to implement and if necessary can be completely autonomous, powered by 20Wp solar panel. Depending on the pedestrian crossing and its needs in terms of vehicle traffic and use, we recommend boosting its visibility with a combination of amber MEGALUX studs and C20a dynamic vertical signs. This combination amplifies the warning sent to drivers. For town entrance pedestrian crossings, the C20a signs are often boosted by dynamic A13b signs. The entire set-up is autonomous and activated by radar or press button. 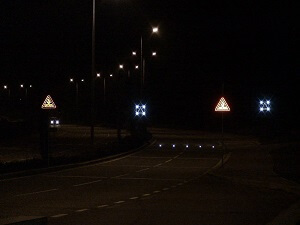 The solar-powered A13b signs can be activated at the same time as the studs and C20a by radio frequency.